In a rare win, seven protesters, including the well-known Bundy brothers, were found not guilty by a jury after they faced charges following the 41-day protest at the Malheur Wildlife Preserve in Oregon. The good news was short lived, though, as the brothers are still being held in jail pending a trial related to their victory over the BLM in 2014 in Nevada. In some much-needed good news, on Oct. 27, a jury found seven protesters, including Ammon and Ryan Bundy, not guilty of charges stemming from the month-long occupation of the Malheur Wildlife Refuge in Oregon. Defense attorneys for the group of demonstrators did an outstanding job of discrediting the prosecution’s case, revealing to the court that, at a minimum, 15 paid federal informants had infiltrated the protest and were likely responsible for some of the worst behavior during the occupation of the federal wildlife preserve. According to the attorneys, one heavily armed informant had traveled all the way from Las Vegas at the behest of the FBI and began brandishing his weapons for the media to see. He also set up daily shooting classes and was likely the one responsible for shooting up the site and leaving behind thousands of rounds of ammunition. From the start of the trial, the prosecutor had little grounds to charge the group, which accounts for why the protesters, in spite of all the drama and character assassinations, faced ridiculous charges such as the main allegation that they conspired to “impede federal workers from their jobs”—a far cry from the salacious claims made by law enforcement and the mainstream media that these were dangerous, violent right-wing extremists. In truth, defense attorneys successfully convinced a jury that the most dangerous and violent extremists at the preserve were evidently the federal informants on the payroll of the FBI, who were sent to provoke demonstrators into committing crimes. While this is certainly good news, there is no turning back the clock on the tragic shooting of Arizona rancher Lavoy Finicum, who was gunned down by state police after law enforcement set up a roadblock on a blind turn, provoking an altercation. Law enforcement claims that Finicum was attempting to draw a pistol when he was shot are disputed by footage shot from a helicopter, which shows Finicum in the classic “hands up, don’t shoot” position before being shot from behind. In addition, cellphone footage shot inside Finicum’s truck clearly shows trigger-happy police unloading on a car full of citizens who were merely on their way to meet with the local sheriff at a town hall meeting. AMERICAN FREE PRESS has interviewed a number of people involved with the protest as well as Cliven Bundy, the father of the Bundy brothers. Cliven was arrested after he showed up following the arrest of his sons. He is currently in jail, facing spurious charges related to his showdown with the Bureau of Land Management (BLM) in Nevada. Following the verdict, the defense attorney for Ammon Bundy demanded that his client be released and then reportedly yelled at the judge after she gave some bizarre reason for keeping Bundy in jail. U.S. marshals ended up tackling Marcus Mumford to the ground and then used a stun gun on him several times before arresting him. Ultimately, the Bundys were not released, though, because they still face charges next year in Nevada stemming from the run-in with the BLM. About a dozen other Oregon demonstrators have already accepted plea deals from prosecutors and are currently serving time in prison. Another ten are awaiting trial, though that now remains in doubt after this latest jury ruling. AFP reached out to the Bundys, but we were unable to get an immediate response before this article was published. 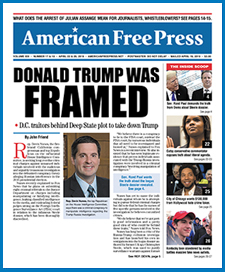 Christopher J. Petherick is the editor-in-chief of American Free Press. Property rights and land use are as fundamental to freedom as power and control are to tyrannical government. The Bundy’s are to be commended for their perseverance and steadfast hold on their beliefs. Today so many Americans are misinformed and uneducated on what it is to be truely free, as the corporations (and the cia) control the news organizations along with the government re-education centers they call public schools, have tried to re-write our history, values and beliefs . These events are the product of greedy government servants trying to capitalize on the public’s good faith and trust as evidenced by Harry Reed’s involvement, along with his son and China trying to steal private land rights for corporate profit. If these events are allowed to continue, all Americans are in danger of losing their private property rights be if for grazing cattle, farming, mineral and water rights, or just the enjoyment of having a place to call home without government intervention. America appears to have regressed to a time much like England was with a king that one had to pay a tribute too, share in the profits from using the kings land, offer his son’s up for knight hood to fight the kings wars and live in the shadow of oppressive control and regulation. Who is answering for the MURDER of Lavoy Finicum? I believe we have witnessed a criminal conspiracy to defraud the American people from their land and Mr. Finicum is a casualty of an overhanded attempt to cover their tracks and draw attention away from their evil deeds. It is a sad day for America in that these events are getting to be an everyday occurrence where one is dragged thru the mud, drawn and quartered in the media and murdered for excercising one’s GOD given right of peacefull protest and standing up for what is right. Maybe these people could go and join the Indians protecting their land and water. They should go unarmed but carry big signs of support.